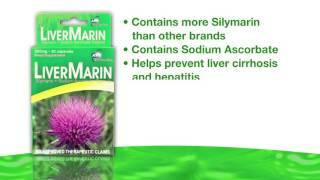 LiverMarin is a dietary supplement containing 250mg of Silymarin or Milk Thistle and 100mg of Sodium Ascorbate. LiverMarin is known to have the potential to protect your liver by acting as an antioxidant; promoting the growth of new liver cells while preventing liver damage. It may also help prevent cirrhosis, the scarring of the liver, which irreversible damages cause you to have a weakened immune system. It is recommended to take 1 capsule 3 times a day before meals. Or, dose as prescribed by your doctor. Treat your liver right, take LiverMarin every day. LiverMarin is SRP P9.00 a capsule. Available at Mercury Drug and other leading drugstores nationwide.